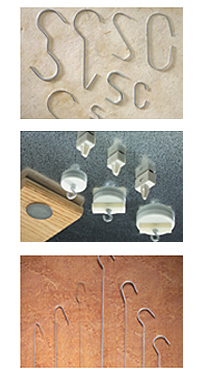 In combination with all ceiling systems we deliver special hooks. Those products also carry the Brugmann know-how completing the optimal presentation of your message. The hooks come in different sizes, lengths and materials. Reliable attachment without leaving any unsightly marks provide the magnet systems for metallic surfaces on ceilings, walls and shelves. The magnets are easy to attach and as easy to remove. Another solution are the self adhesive metal plates. Those are easy to install and can be delivered with the correct magnets.